As we remember Imam Ali Raza (AS) on the day of his shahadat, we are discussing the hadith of The Golden Chain, found here, on pg 12. It is narrated that the angel Jibraeel (AS) told the Holy Prophet (SAW), who told Imam Ali (AS), and each Imam told the next Imam (AS) that Allah (SWT) said “Laa ilaala illallah is My fortress and whoever enters My fortress saves himself from My punishment.” One of the conditions of this is complete submission to the Imam (AS) of the time. 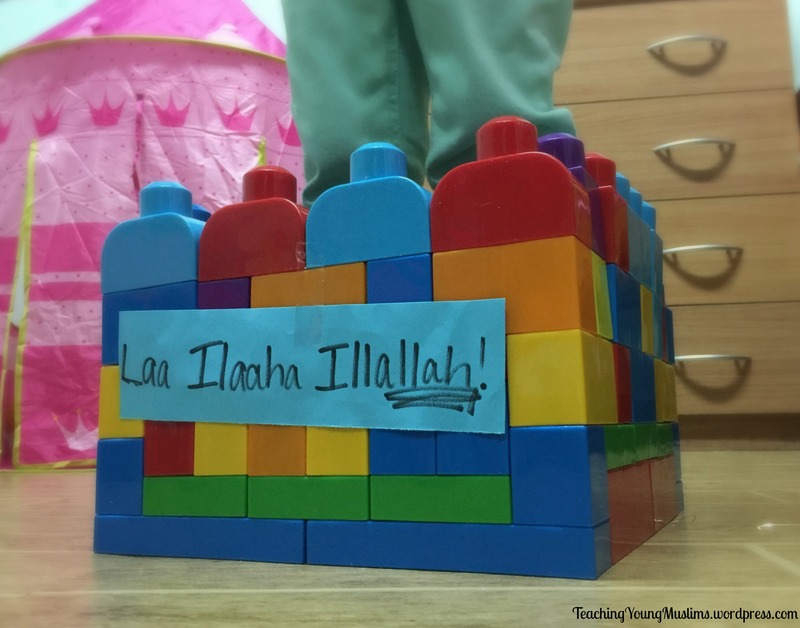 My daughter stood inside the fort as we discussed that Laa Ilaaha Illallah means that there is no god except Allah (SWT). For her age, we kept it simple. We discussed that when you believe that there is no god but Allah, and that there are many many Prophets, and 12 Imams (AS), Allah protects us and takes care of us as if we are inside a fort. For an older child, a more in-depth discussion would be appropriate. You can discuss that believing that there is no god but Allah and submitting to the Imam (AS) of our time means that we remember this wherever we go and whatever we do. We pay attention to this fact in all aspects of our lives, trying to please Allah (SWT) in everything that we do.